I'm using ThinkGeo 10 in WebForm ,it's using openlayer 2.13.1.js library to get the tile images from server . Because of that sometimes too mane requests are getting in pending state . 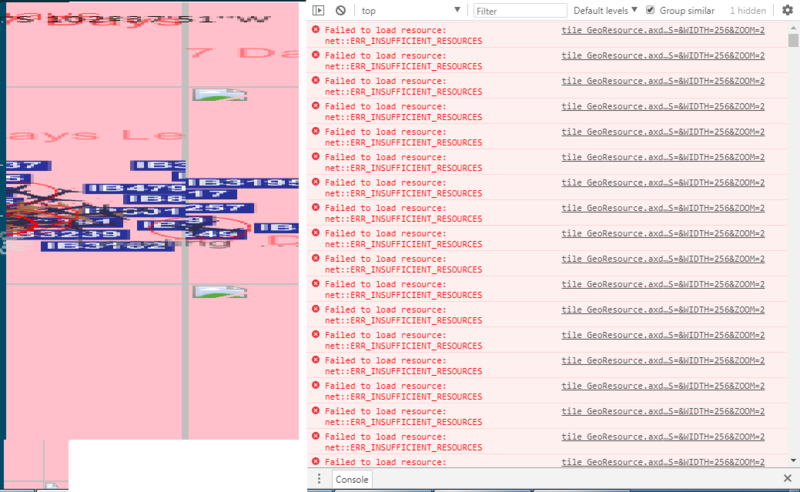 As a result I'm getting red layer over the map because browser precache is overflowing or server is not processing the request(I have No idea about it).I'm getting 'failed to get resources: tile_georesources.axd' in browser console . How can i solve this issue? Can I do it with tilecache ? If ,it is possible then provide some sample. Please download it and see whether it works for you. I guess your code have some problem, so please try the sample code first. You should want to upgrade the packages to latest version. got this error from one of your sample app @Ethan. That's strange because it looks this isn't the error from map but looks like a browser error. I tried to query the same error from internet and hadn't get any valid suggestion. Could you please try another browser for example Firefox or IE to see whether it can be reproduced, or you can try to clear cache and if that still don't works, another try in a VM or the other machine can make sure whether it's a environment problem or not. Please also check the FireWall if you open it in your machine.